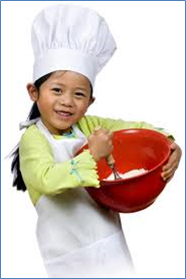 Kids Cook Club is an activity that will be introduced, for the first time, in 2016. This extra mural activity will be offered to children in Grade 4 and 5. Further details will be provided during the course of the school year. Grade 4 and 5 learners may participate in this activity. A maximum of 8 learners will be accepted. Kid’s Cook Club runs from Term 1 to term 4 and takes place in a classroom, the school hall or tuck shop, defending on the day’s menu. Please refer to the extra mural timetable for times and days. Participants may wear any informal clothing to their lessons. An apron is a pre-requisite. All other equipment will be provided by the school.